From simple to intricate, from kitchen cabinets to entryways, custom millwork doors give your home a more polished appearance. At A-K Custom Interiors, we design and build custom doors with your home and your style in mind. 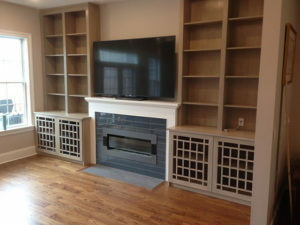 Take a look at some of our recent work to see how custom millwork doors can make a difference in your home. Diamond lattice over mirrors on these custom millwork doors gives this walnut wall-to-wall shelving unit an added style boost. The mirrors help the room feel both bigger and brighter. 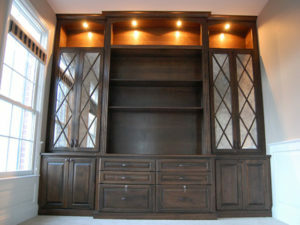 In addition to looking great, the doors also provide our client with lots of hidden storage. Not all doors are designed to make a great first impression. In fact, some of them are meant to go completely unnoticed. 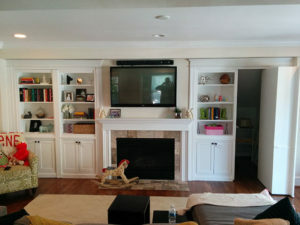 To provide access to a storage area behind this family’s wall-to-wall entertainment area, we built a secret door on the righthand side. When the door is closed it looks just like the rest of the built-in shelving. For this built-in, we decided to build custom millwork doors that would be seen as a focal point for the room, while still operating in a completely functional manner. 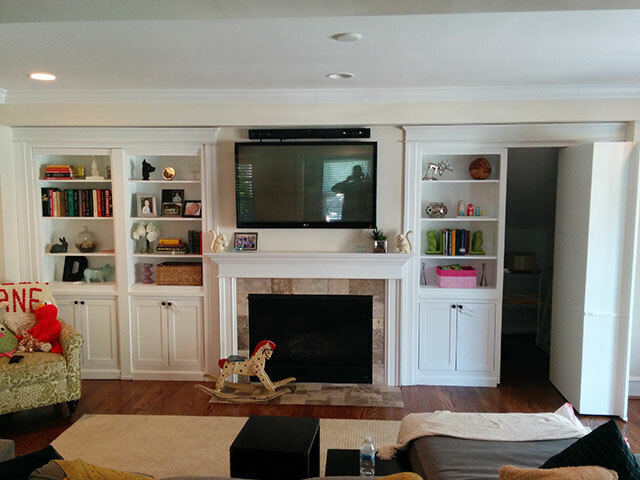 Because the doors are designed in an open-grid pattern, our clients can use remotes to operate any electronics they have without having to open the cabinet doors. 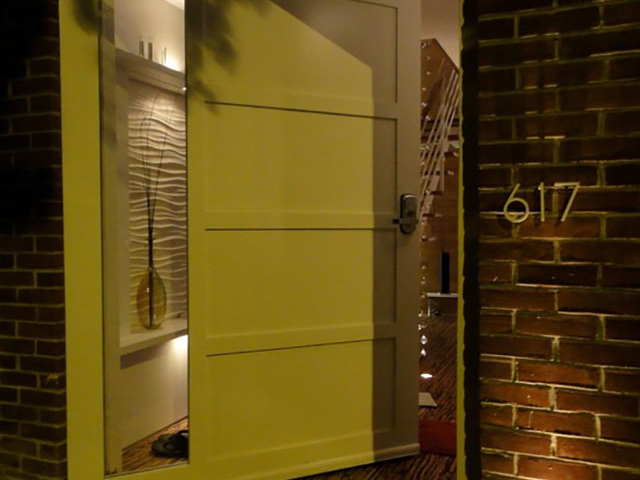 This custom door is a gorgeous counterpoint to this brick home. 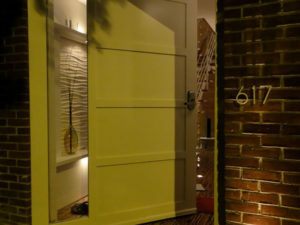 The door’s style is minimalist Shaker in construction and modern in both color and installation. The oversized four-panel door doesn’t have your typical left or right inswing but instead is a pivot door. The door actually swings open on a pivot box rather than hinges, resulting in a modern look and a spacious entryway. The pivot door style has been gaining in popularity over the last 5 years and makes a wonderful first impression. To see more examples of entry doors, check out our portfolio. Whether you’re renovating your front porch, home office, or kitchen, A-K Custom Interiors can provide beautiful custom millwork doors, built exactly to your specifications. Learn more about working with us or schedule a complimentary consultation and get started on your design today!